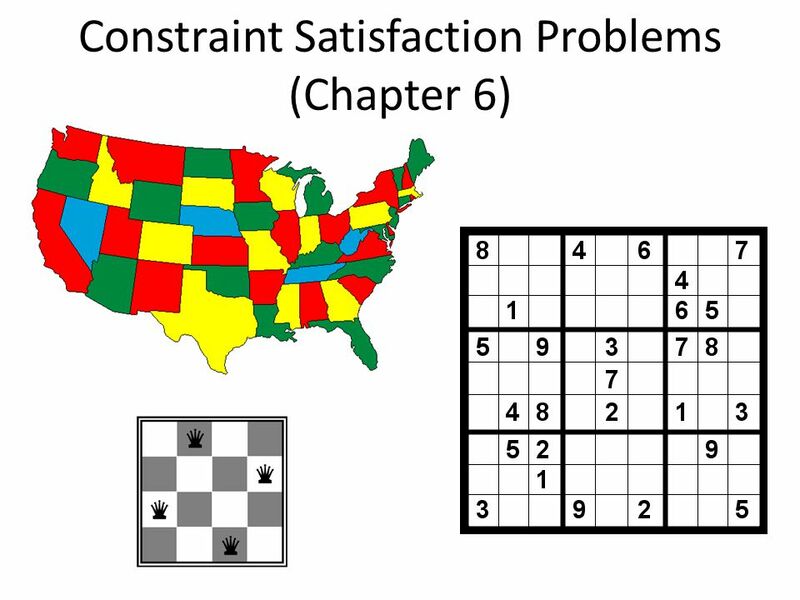 Constraint Satisfaction Problems (Chapter 6). 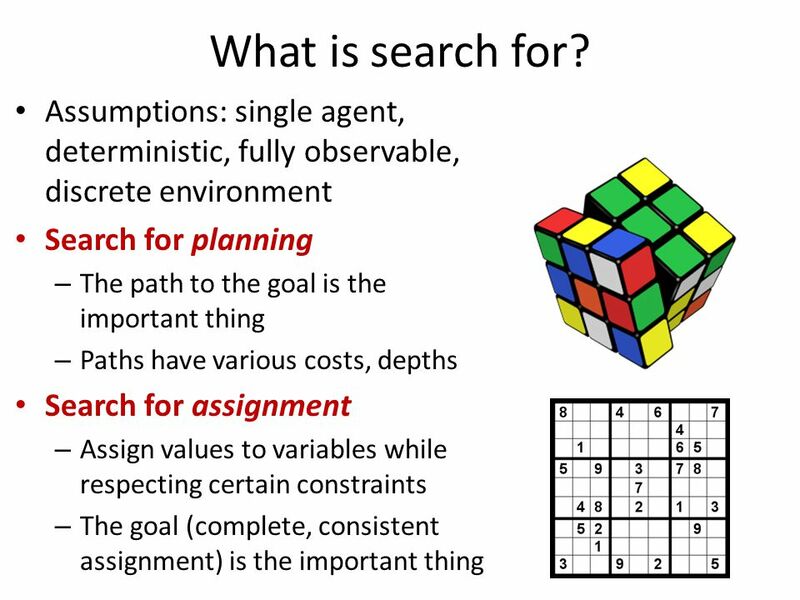 What is search for? 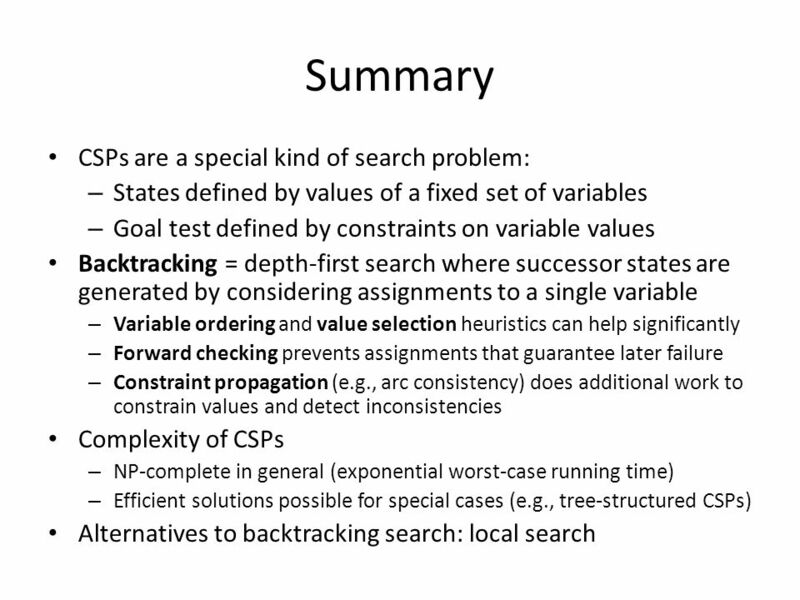 Assumptions: single agent, deterministic, fully observable, discrete environment Search. 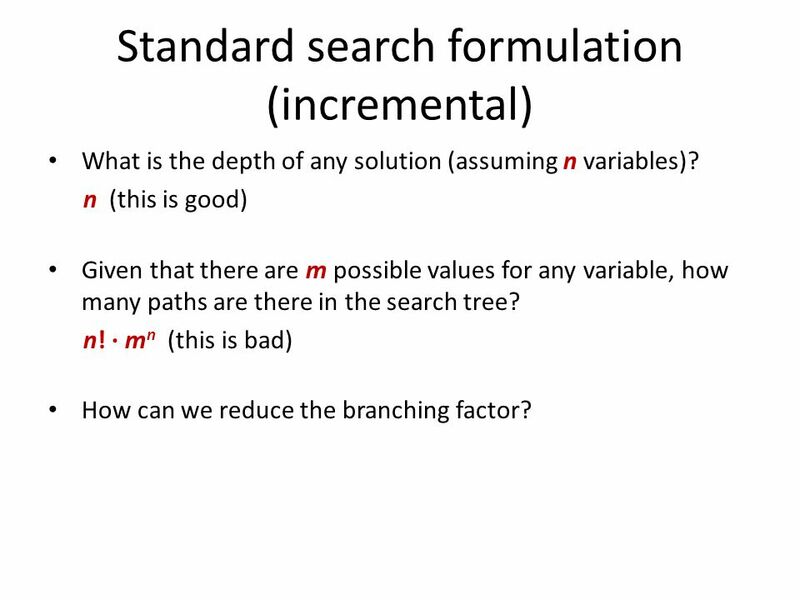 13 Standard search formulation (incremental) What is the depth of any solution (assuming n variables)? 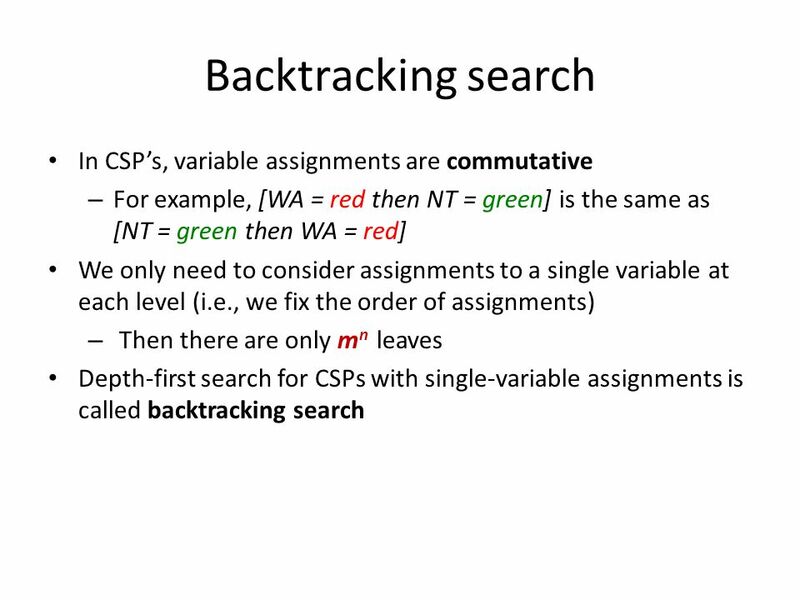 n (this is good) Given that there are m possible values for any variable, how many paths are there in the search tree? 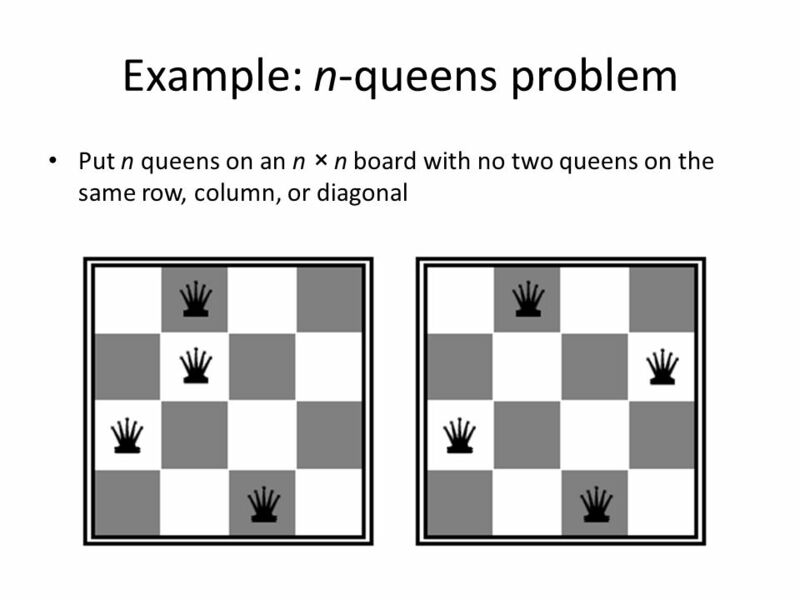 n! 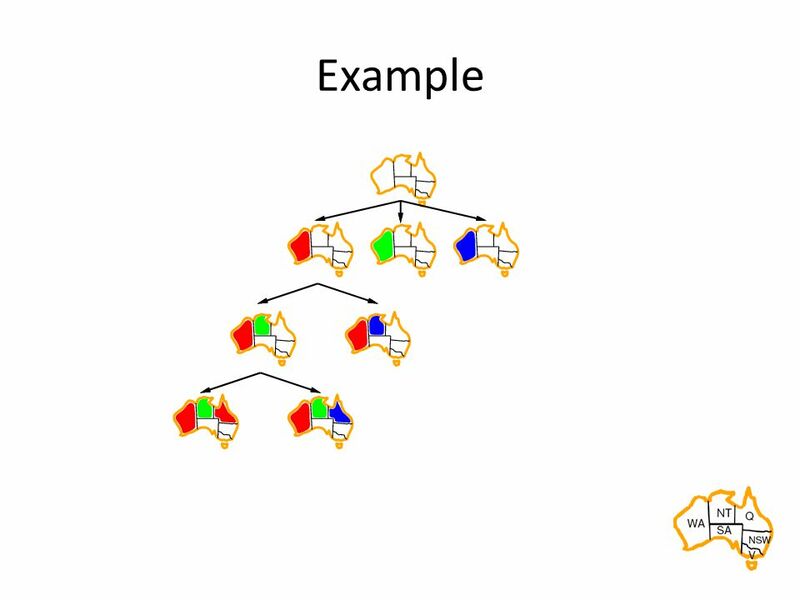 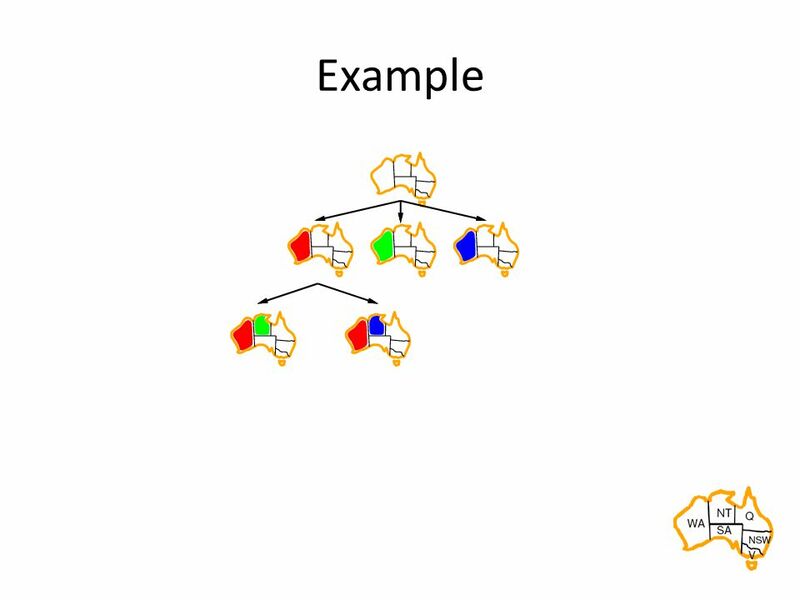 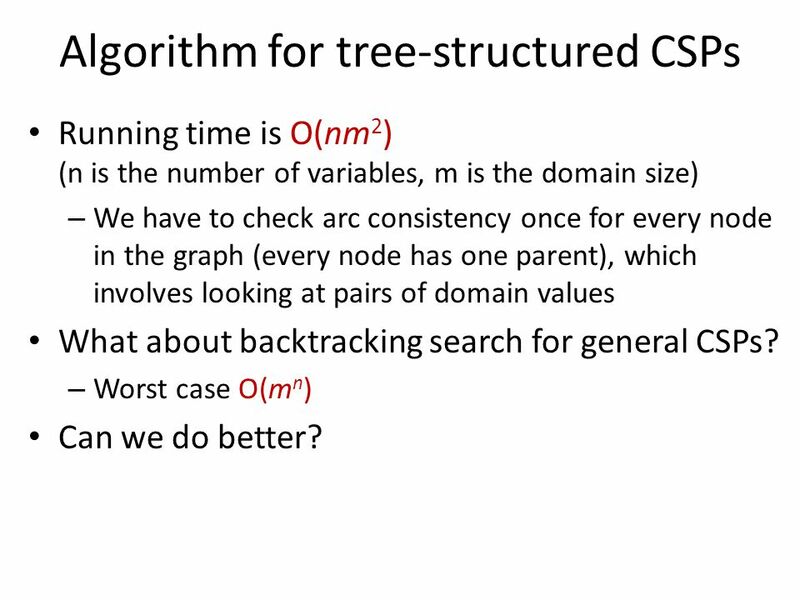 · m n (this is bad) How can we reduce the branching factor? 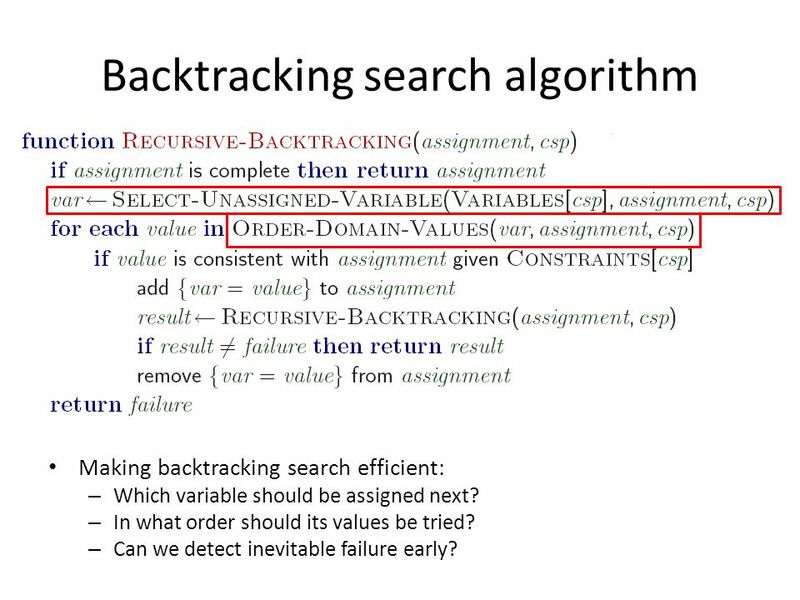 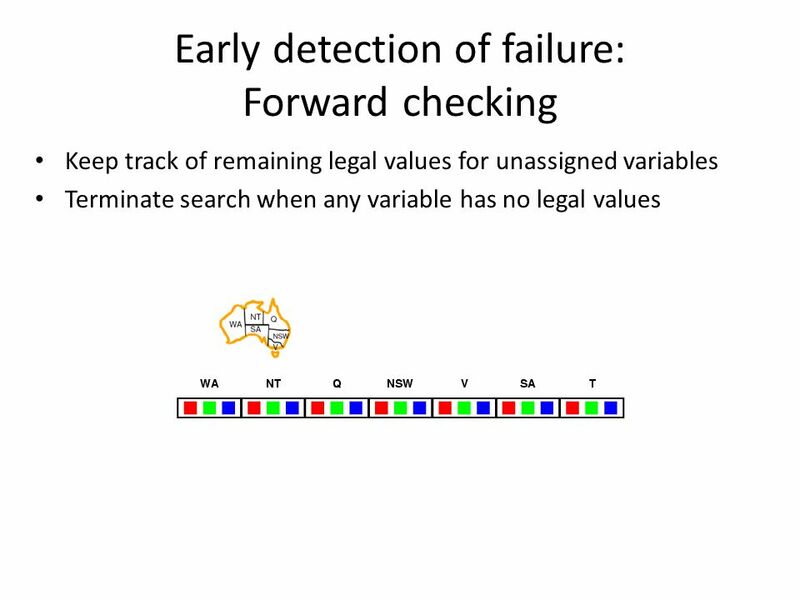 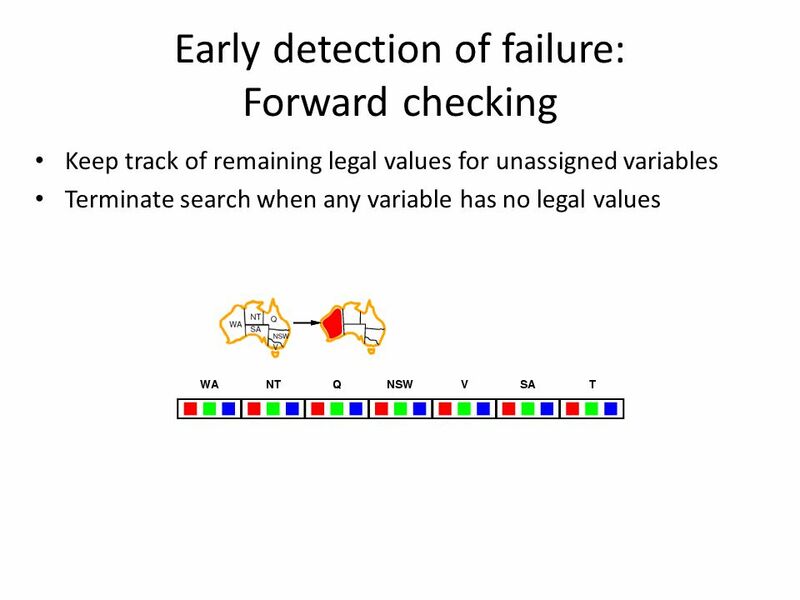 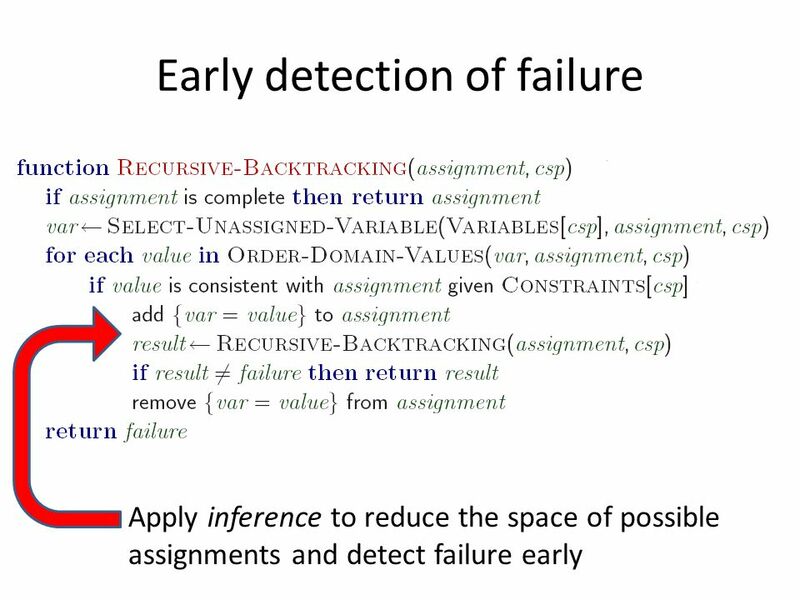 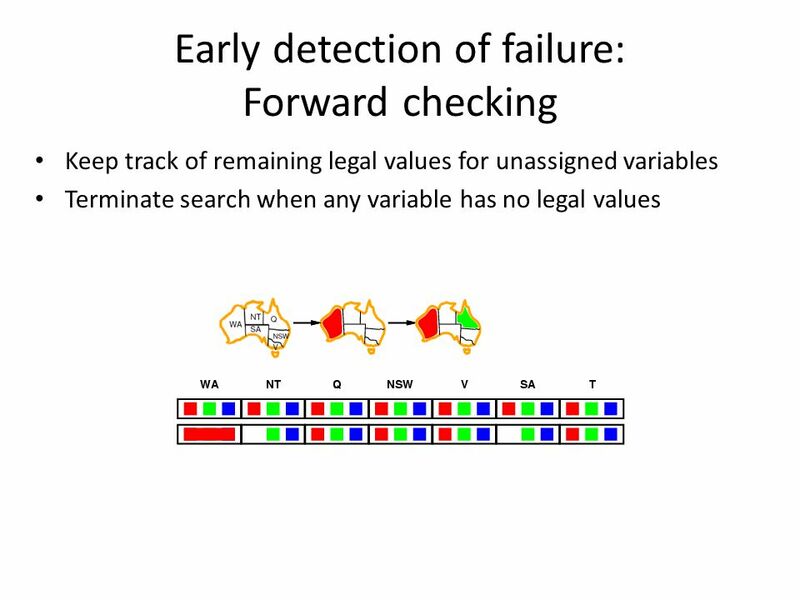 19 Backtracking search algorithm Making backtracking search efficient: – Which variable should be assigned next? 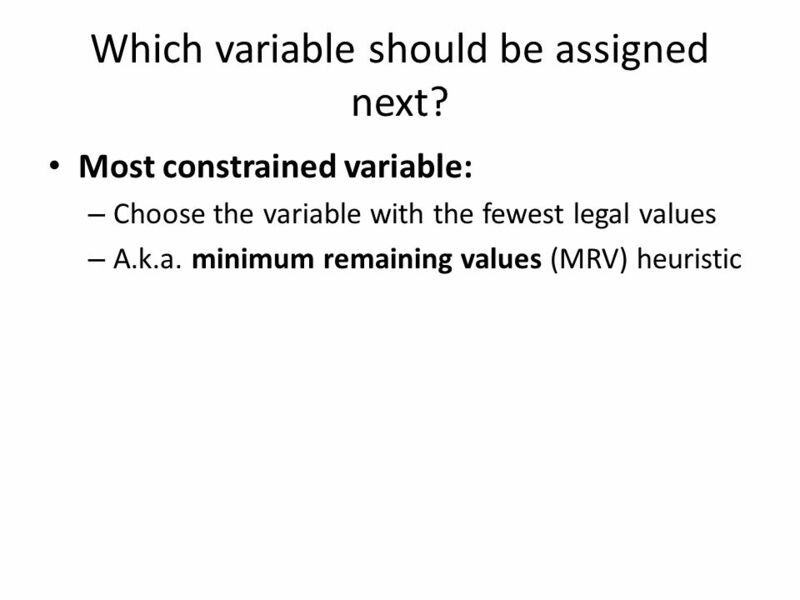 – In what order should its values be tried? 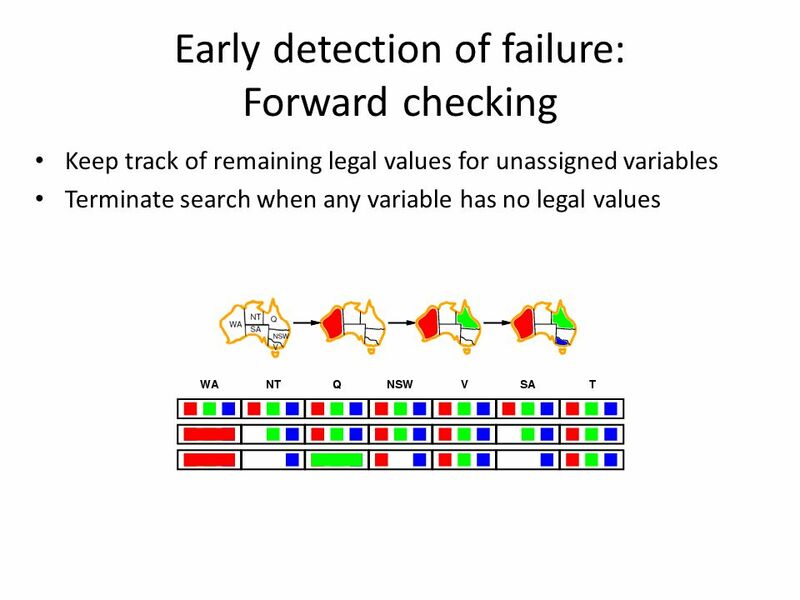 – Can we detect inevitable failure early? 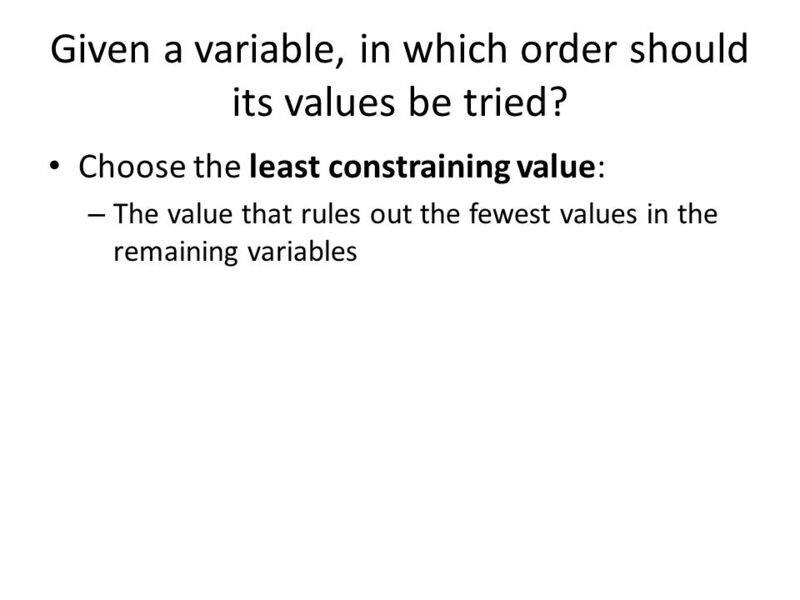 25 Given a variable, in which order should its values be tried? 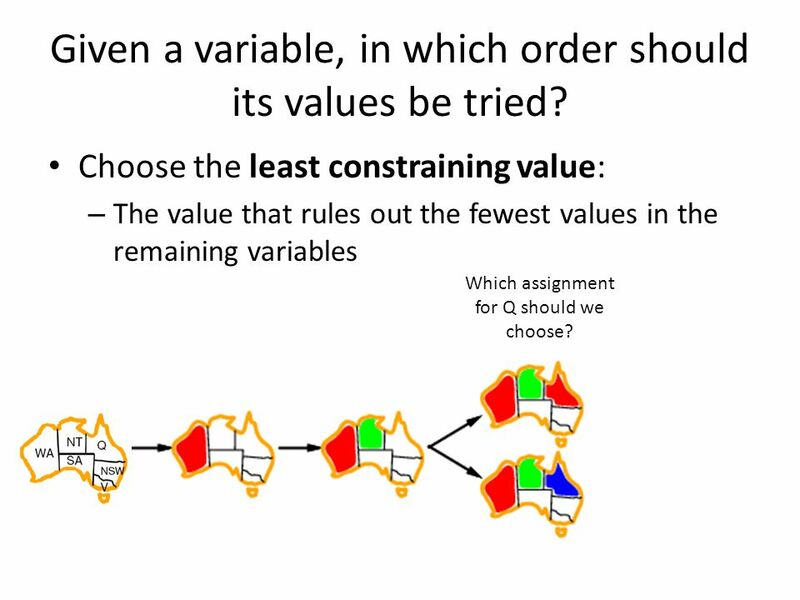 Choose the least constraining value: – The value that rules out the fewest values in the remaining variables Which assignment for Q should we choose? 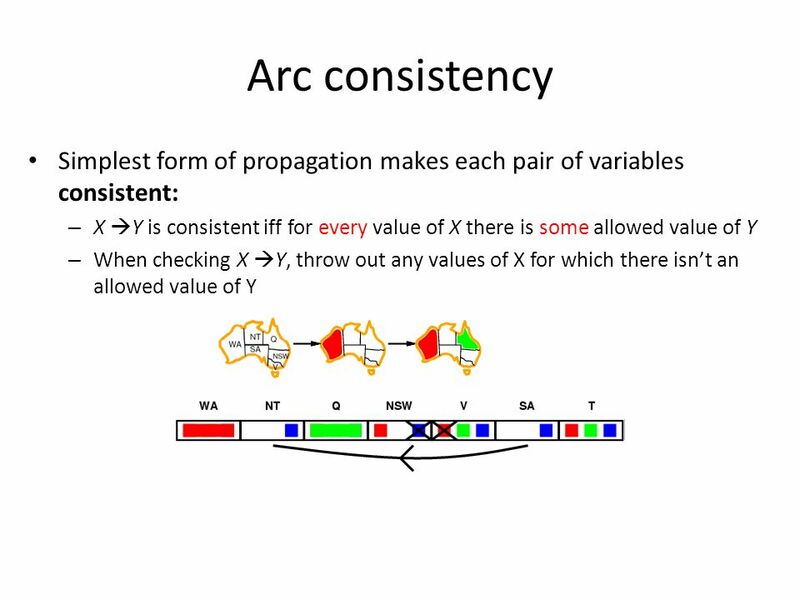 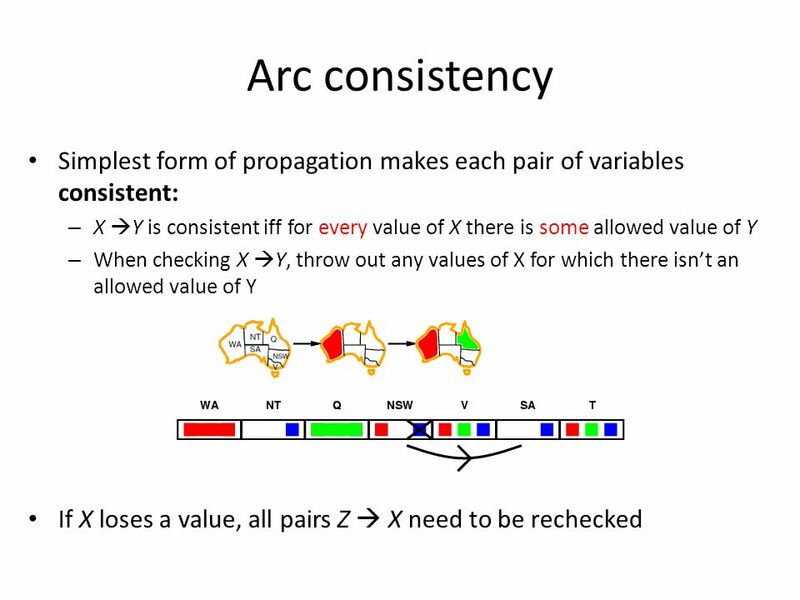 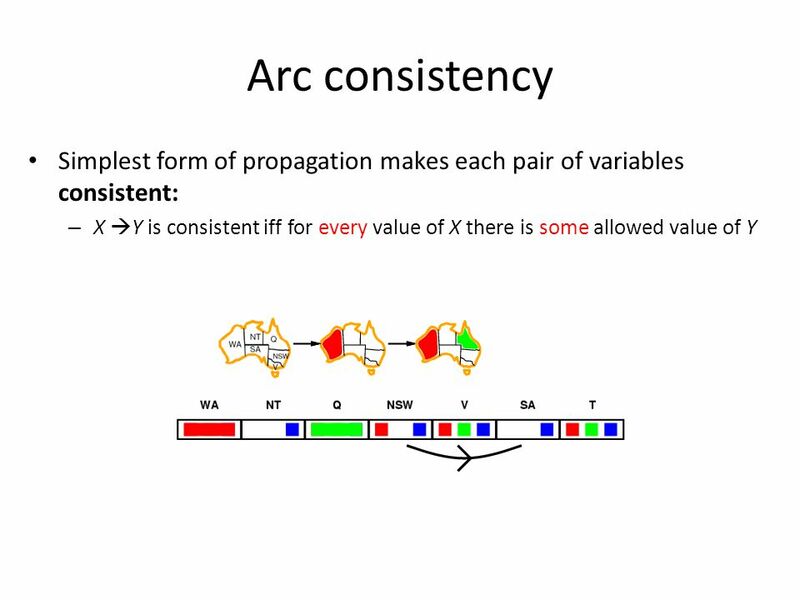 33 Simplest form of propagation makes each pair of variables consistent: – X  Y is consistent iff for every value of X there is some allowed value of Y Arc consistency Consistent! 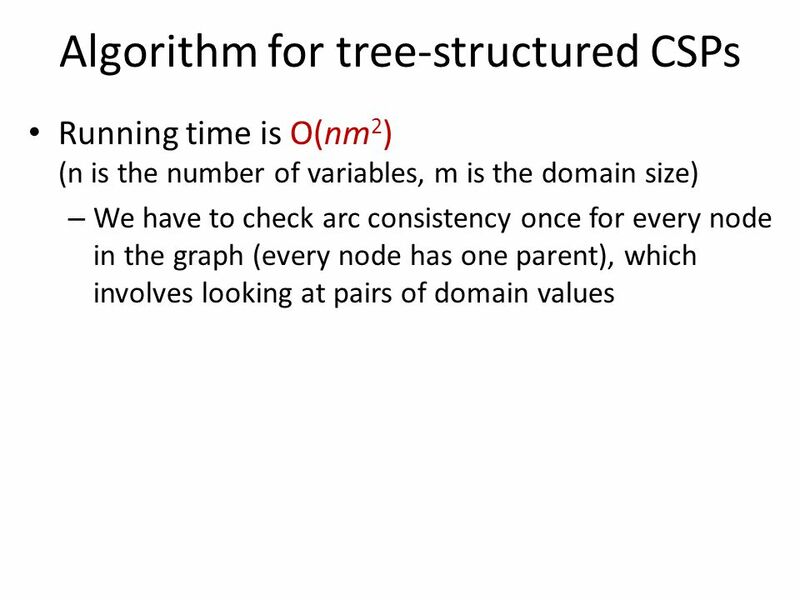 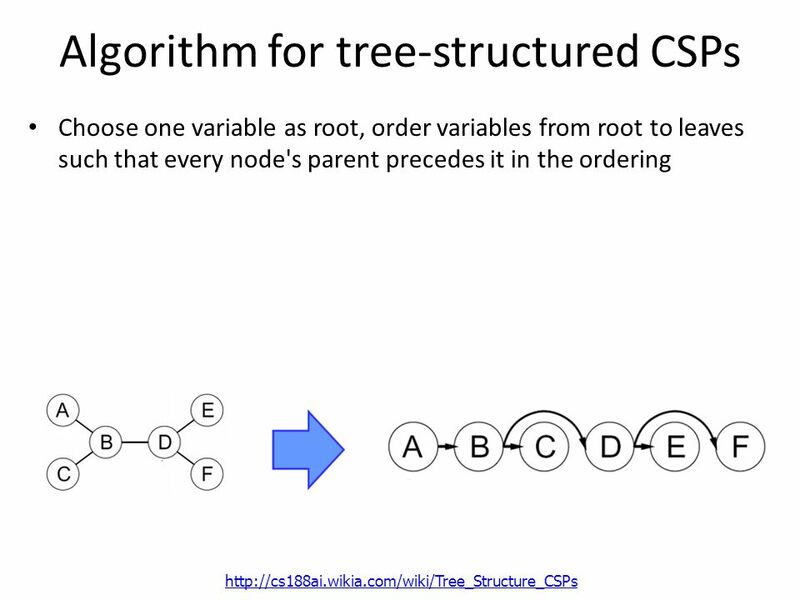 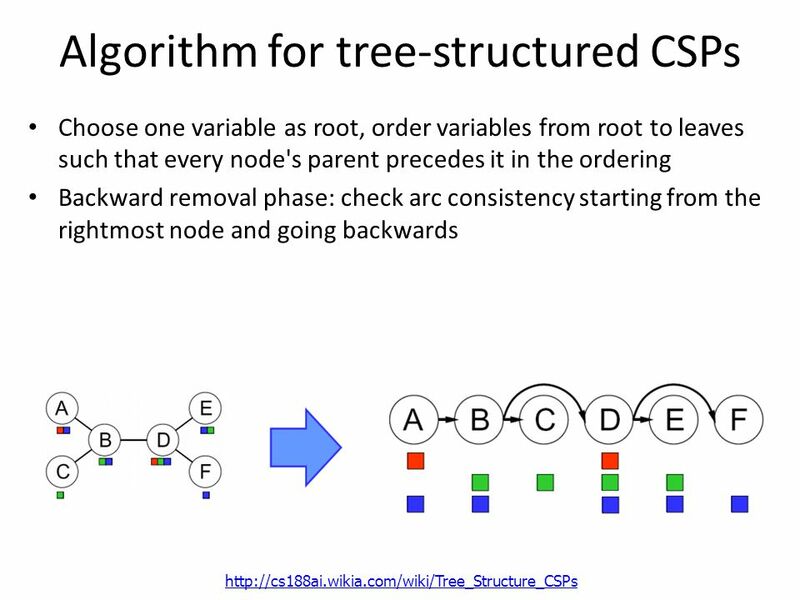 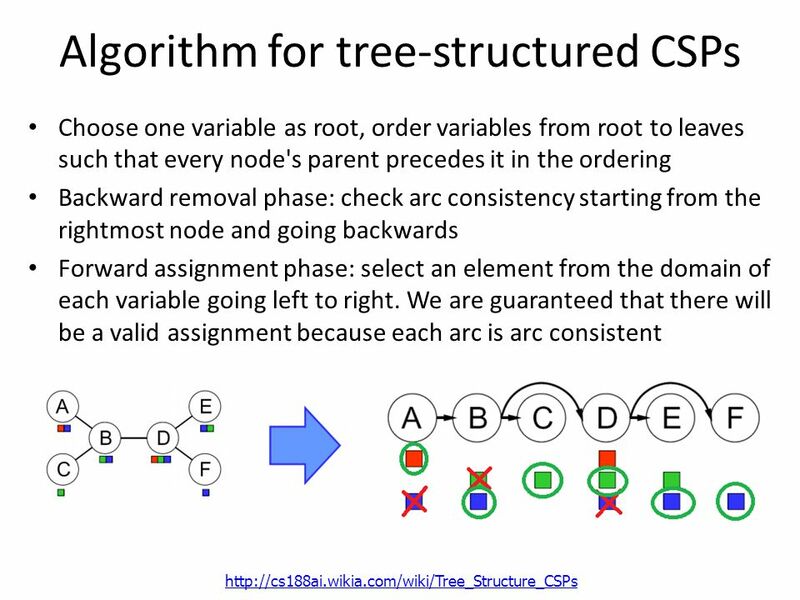 48 Algorithm for tree-structured CSPs Running time is O(nm 2 ) (n is the number of variables, m is the domain size) – We have to check arc consistency once for every node in the graph (every node has one parent), which involves looking at pairs of domain values What about backtracking search for general CSPs? 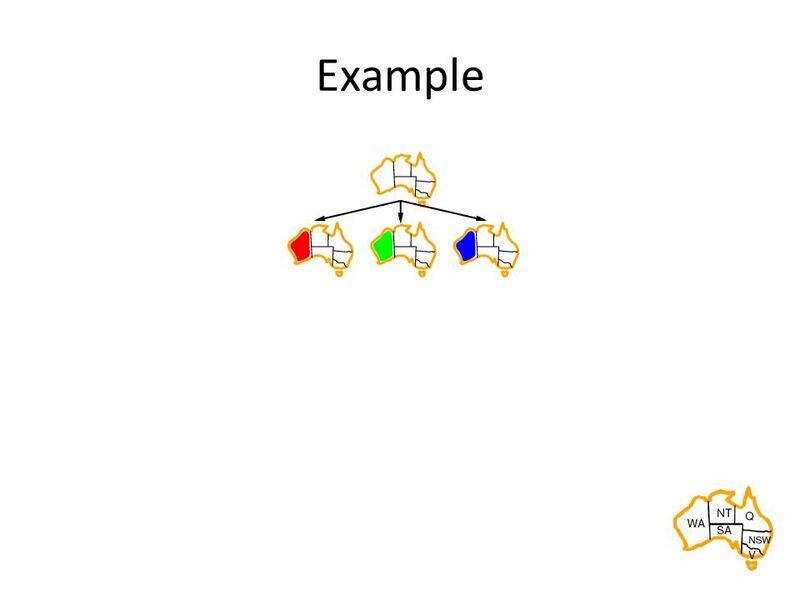 – Worst case O(m n ) Can we do better? 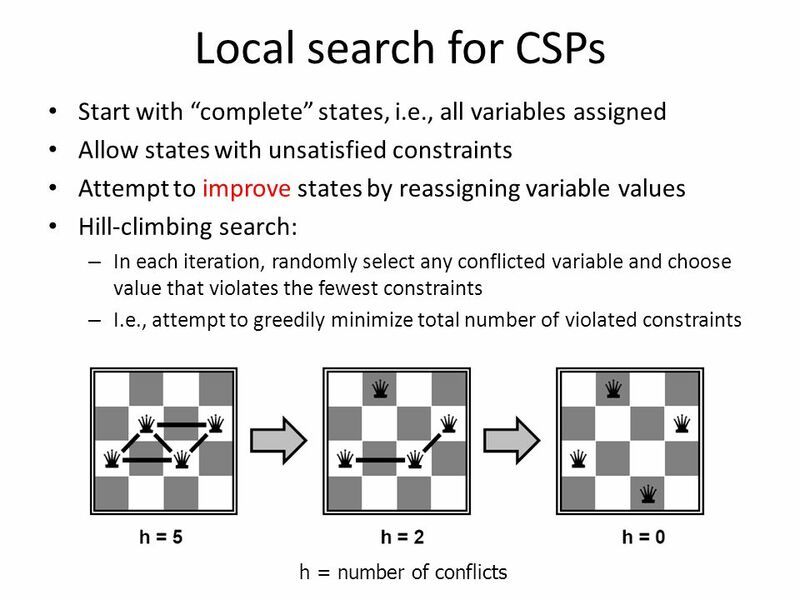 49 Computational complexity of CSPs The satisfiability (SAT) problem: The satisfiability (SAT) problem – Given a Boolean formula, is there an assignment of the variables that makes it evaluate to true? 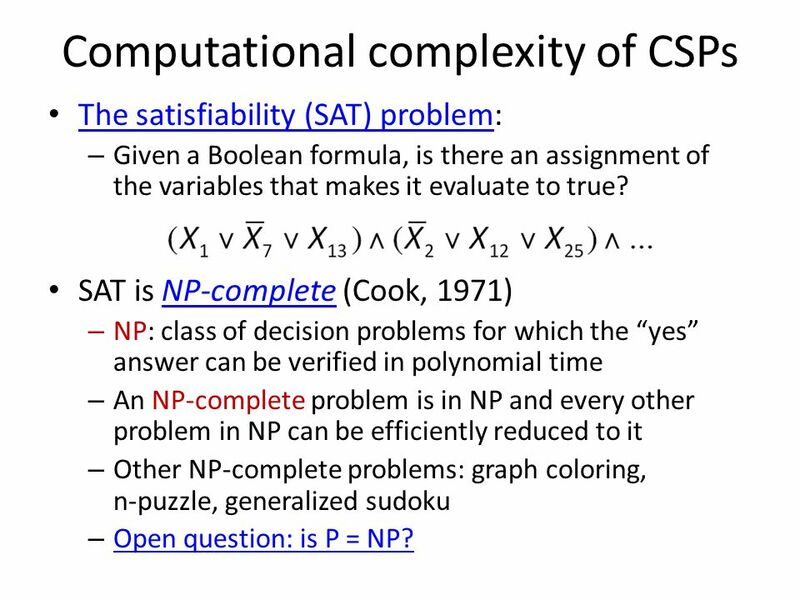 SAT is NP-complete (Cook, 1971)NP-complete – NP: class of decision problems for which the “yes” answer can be verified in polynomial time – An NP-complete problem is in NP and every other problem in NP can be efficiently reduced to it – Other NP-complete problems: graph coloring, n-puzzle, generalized sudoku – Open question: is P = NP? 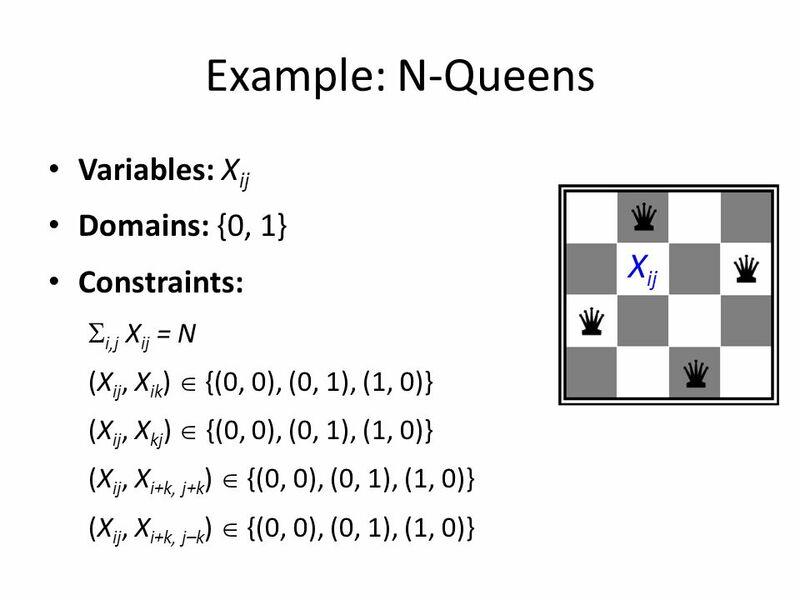 Open question: is P = NP? 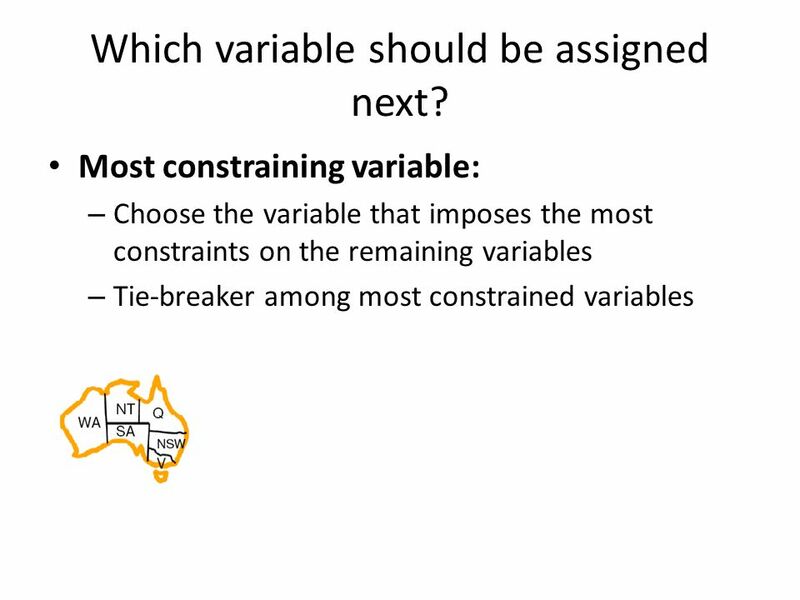 Download ppt "Constraint Satisfaction Problems (Chapter 6). 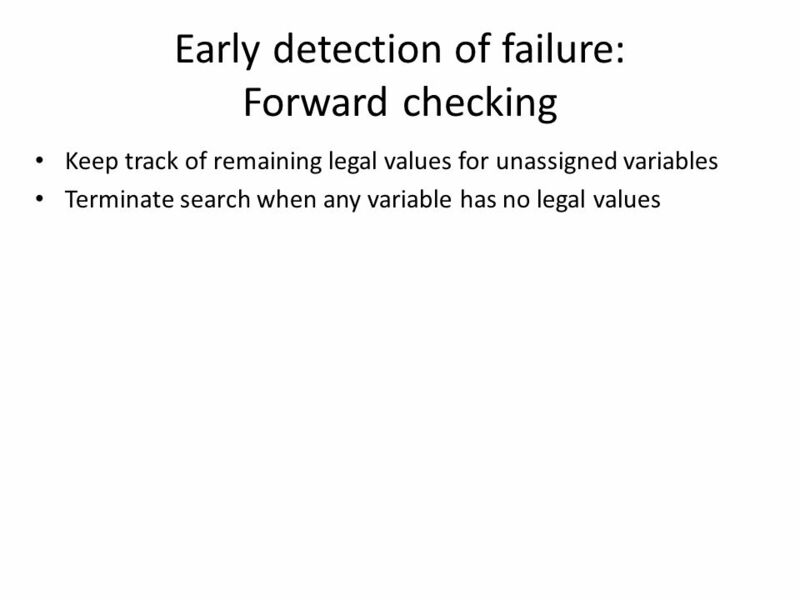 What is search for? 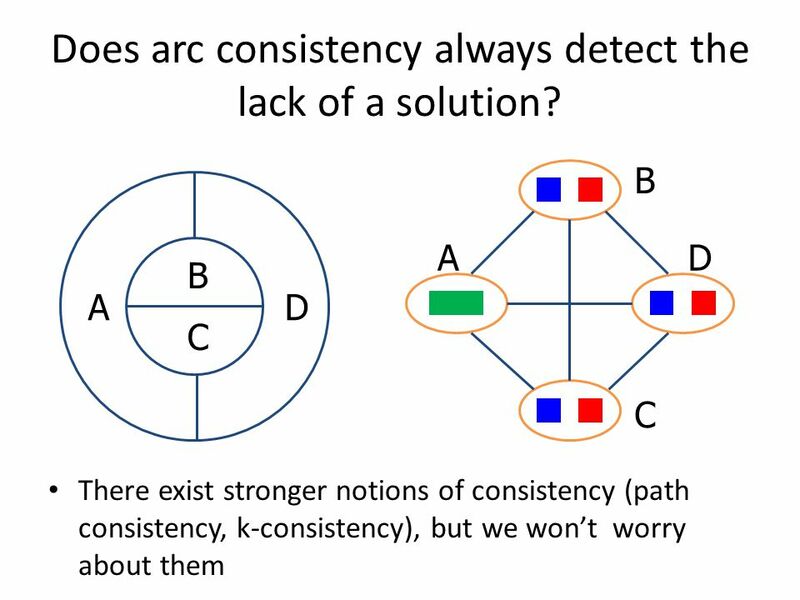 Assumptions: single agent, deterministic, fully observable, discrete environment Search." 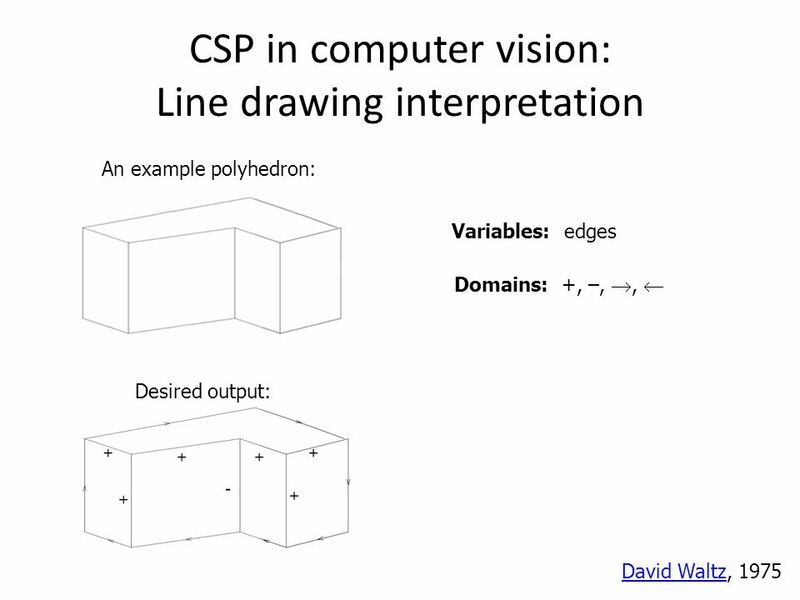 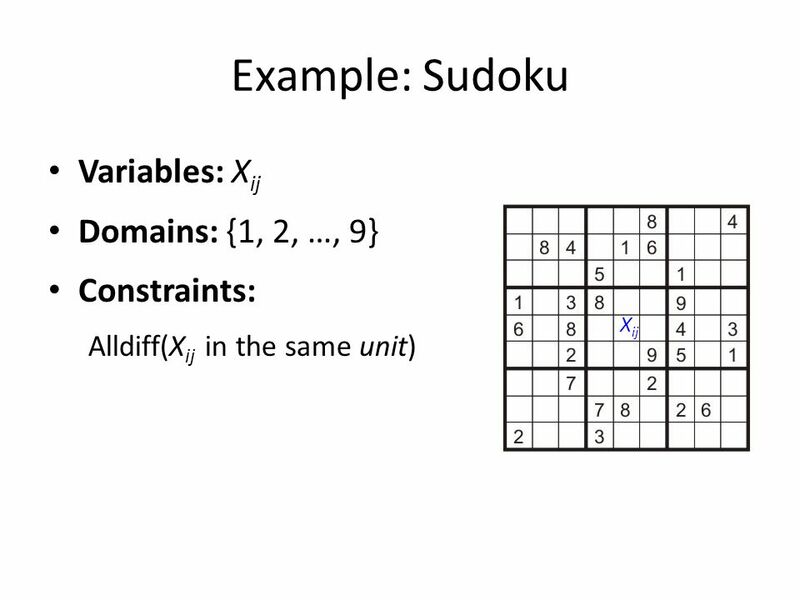 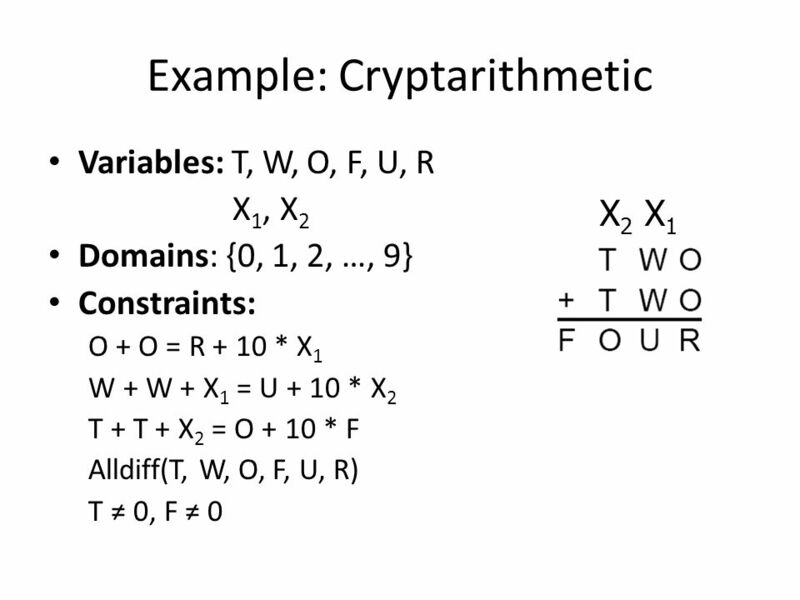 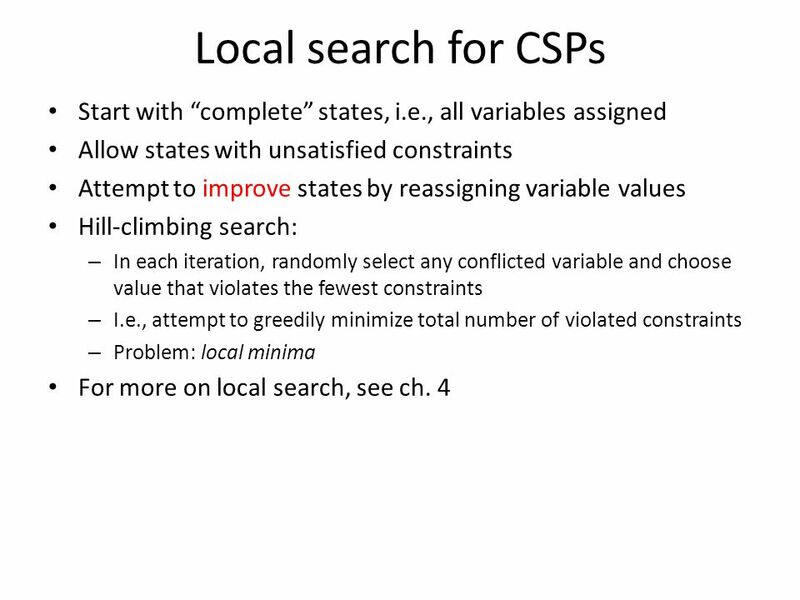 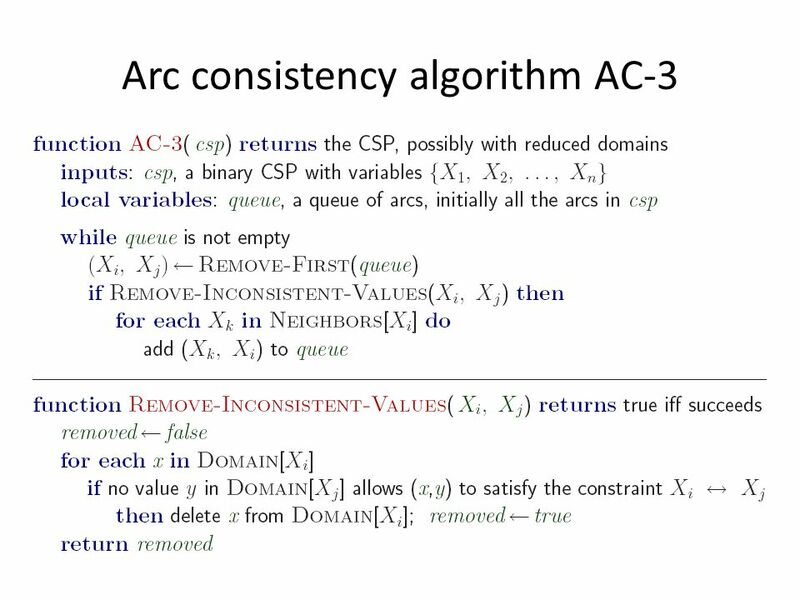 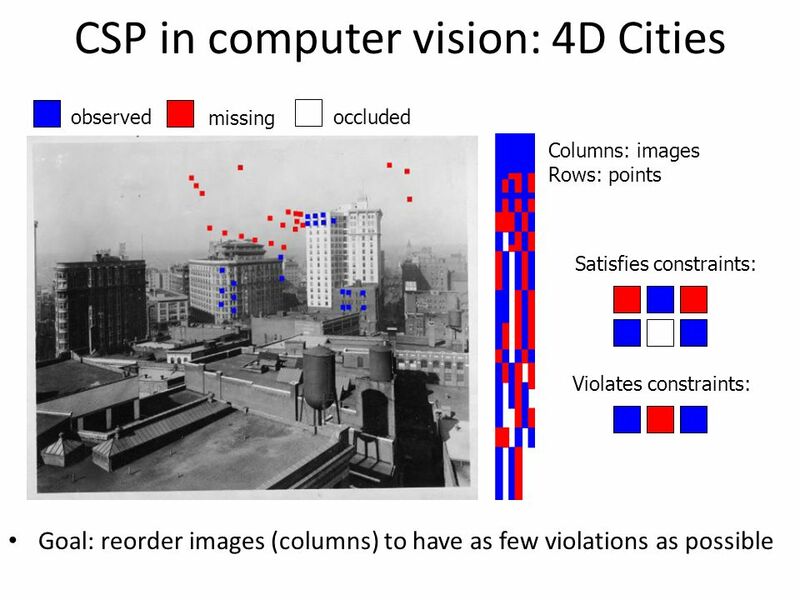 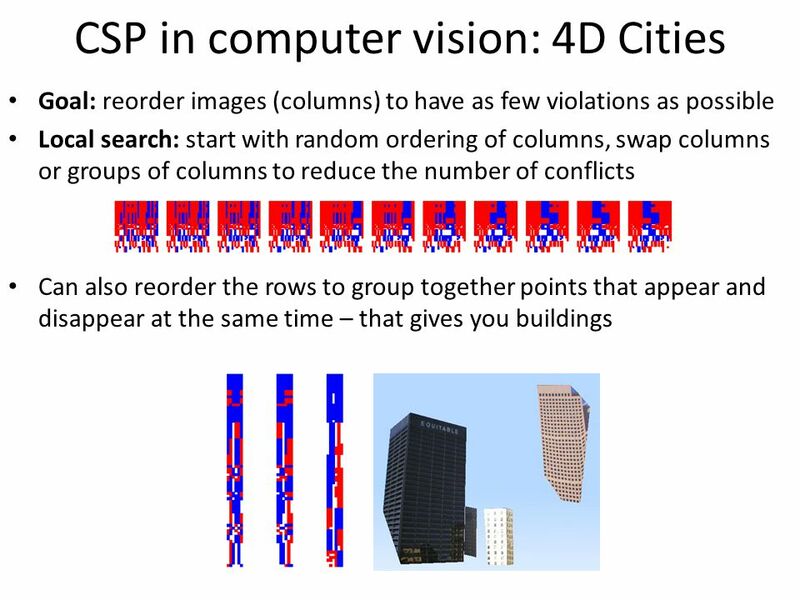 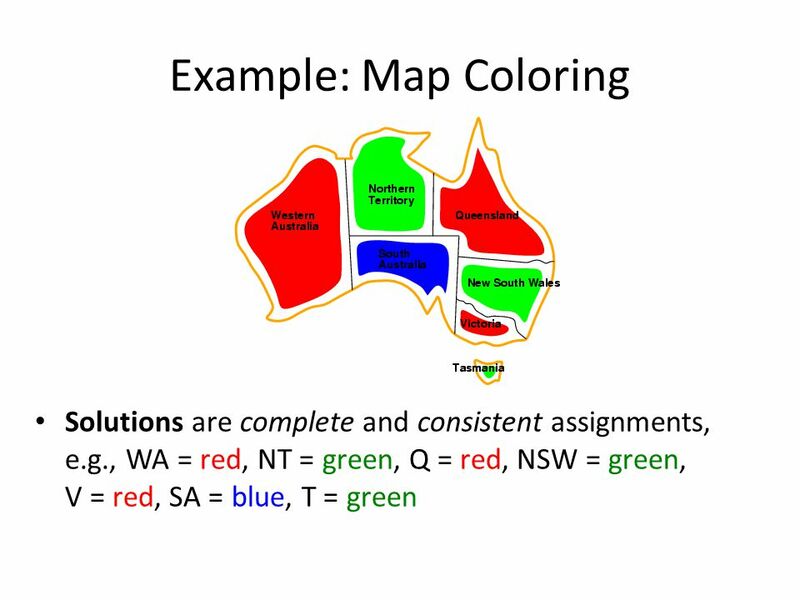 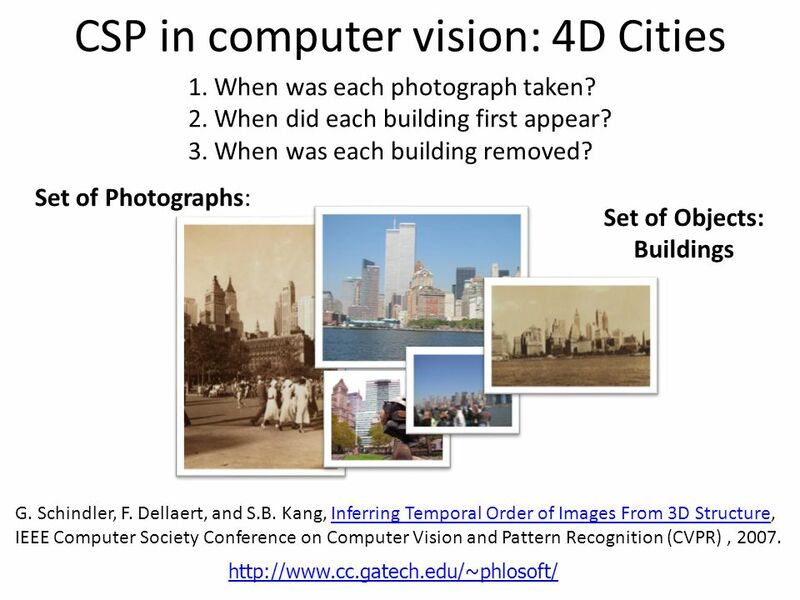 Lecture 11 Last Time: Local Search, Constraint Satisfaction Problems Today: More on CSPs. 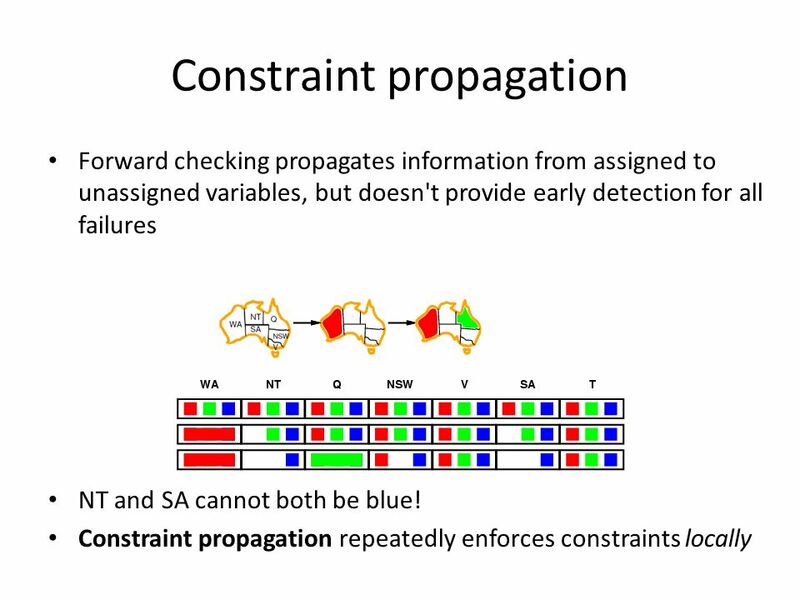 1 Constraint Satisfaction Problems. 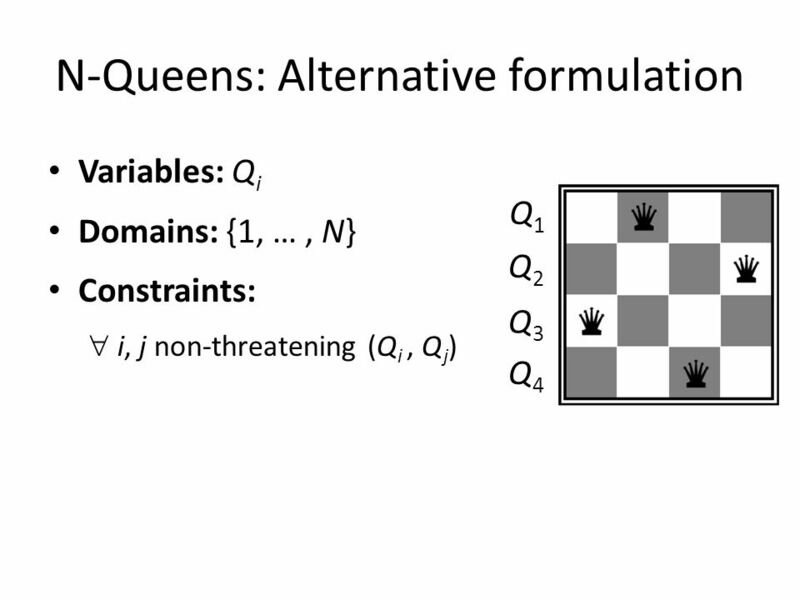 2 Intro Example: 8-Queens Generate-and-test: 8 8 combinations. 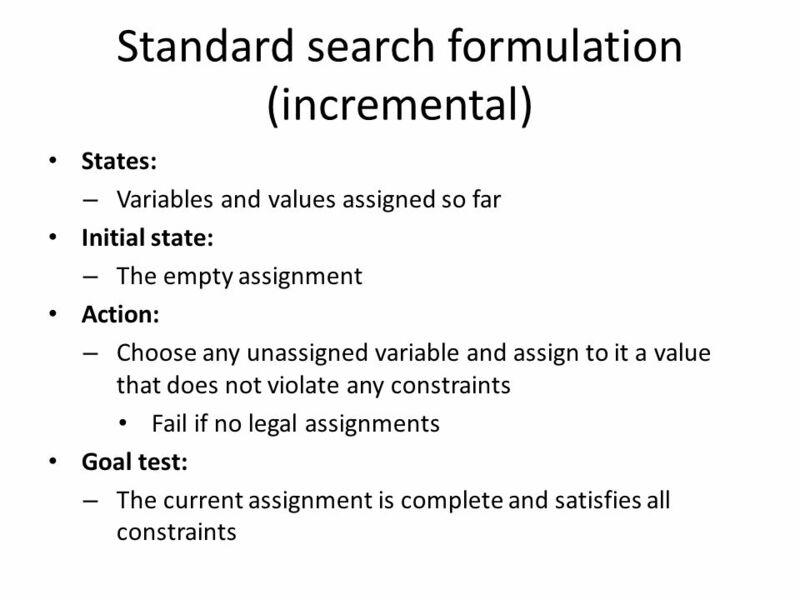 ICS-271:Notes 5: 1 Lecture 5: Constraint Satisfaction Problems ICS 271 Fall 2008. 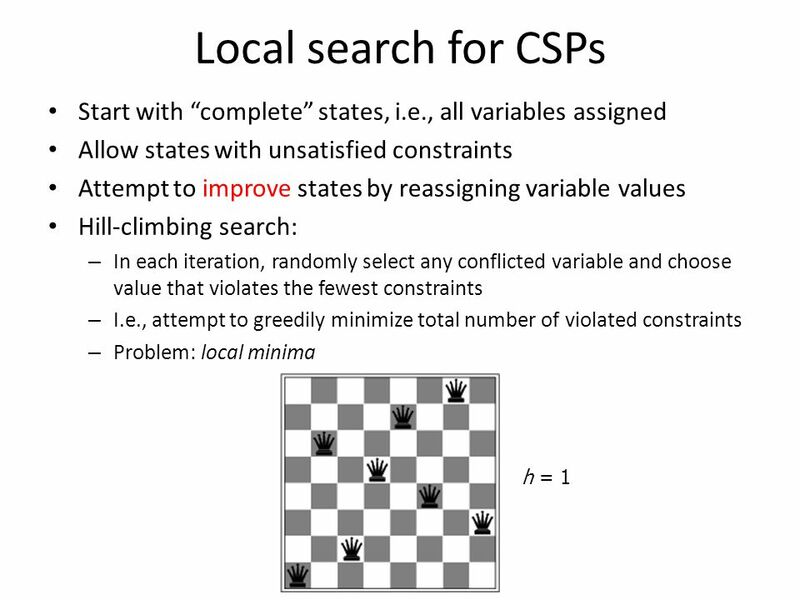 Artificial Intelligence Constraint satisfaction problems Fall 2008 professor: Luigi Ceccaroni. 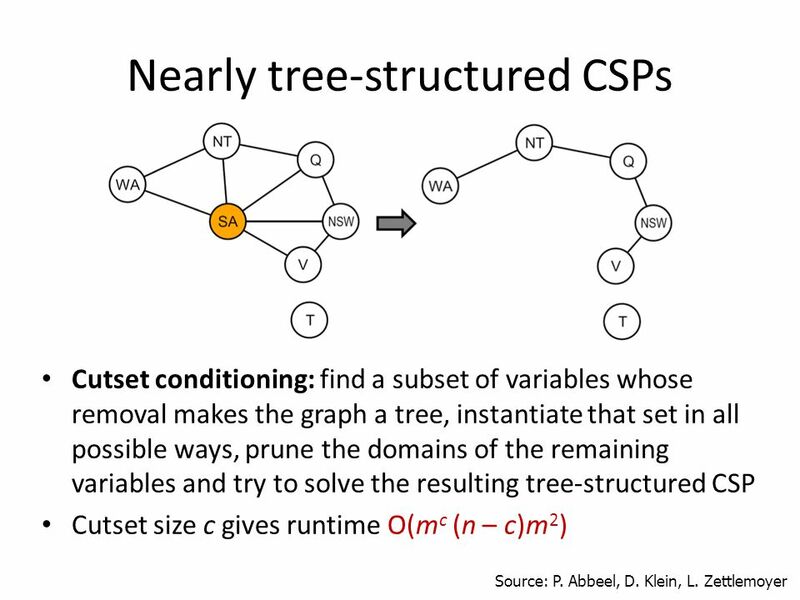 Review: Constraint Satisfaction Problems How is a CSP defined? 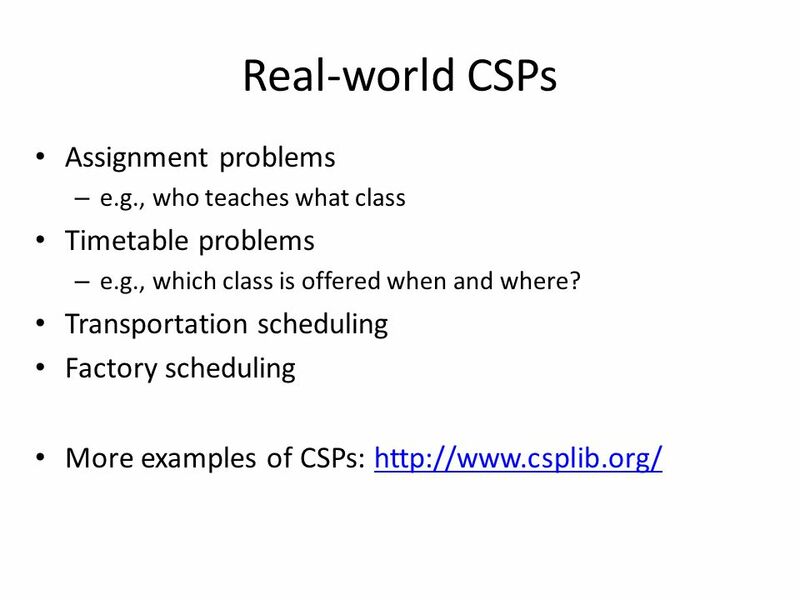 How do we solve CSPs? 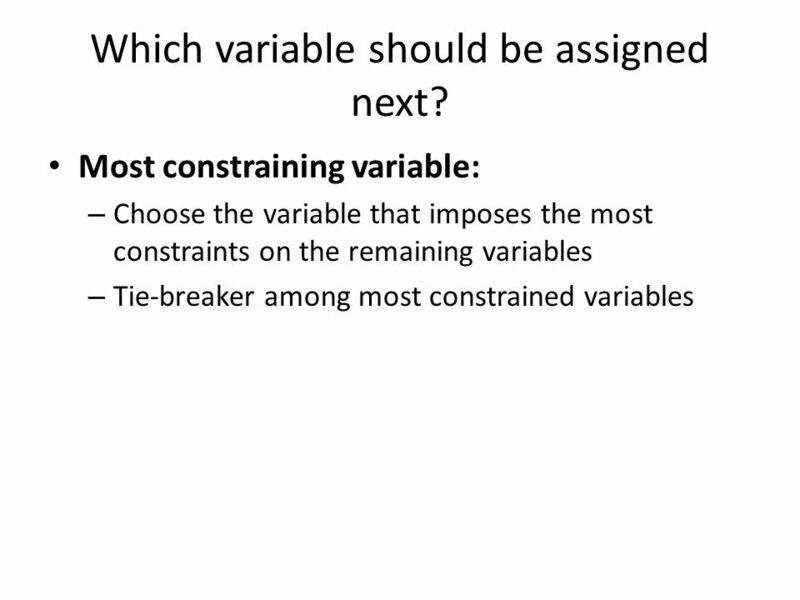 Constraint Satisfaction Problems. 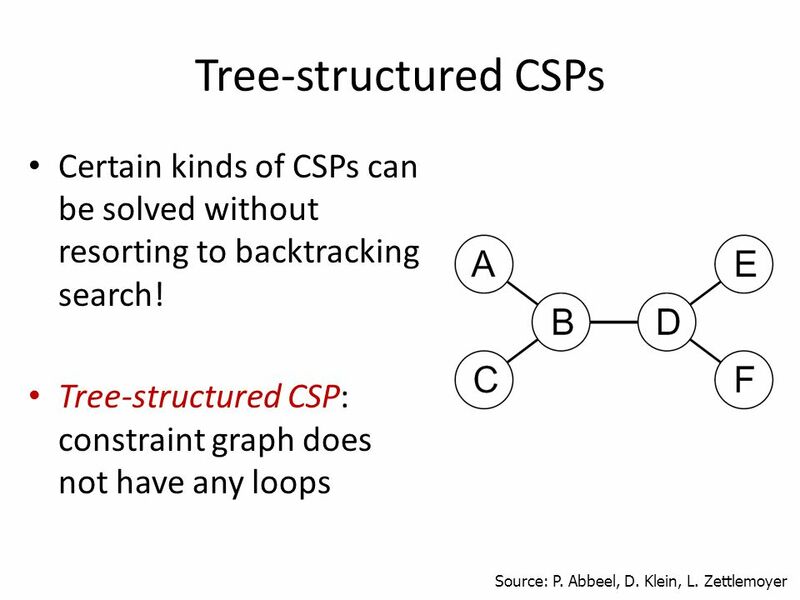 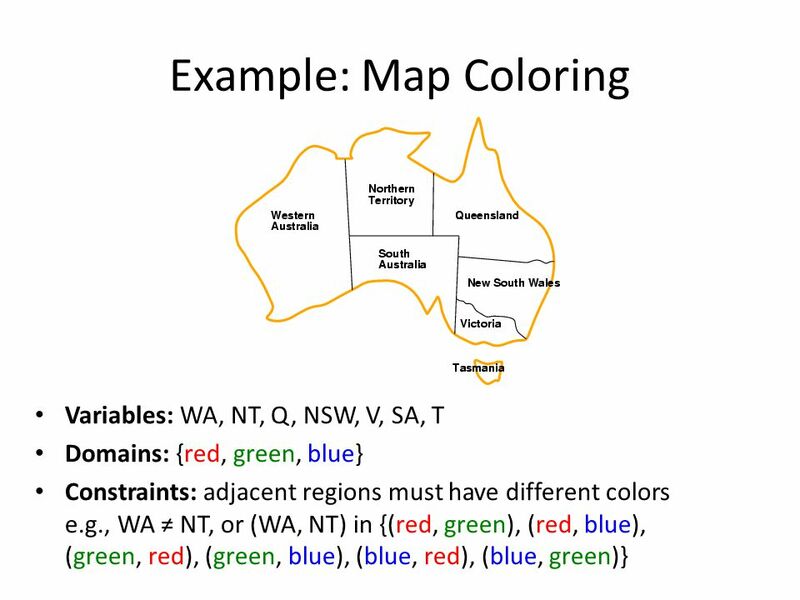 Constraint satisfaction problems (CSPs) Standard search problem: – State is a “black box” – any data structure that. 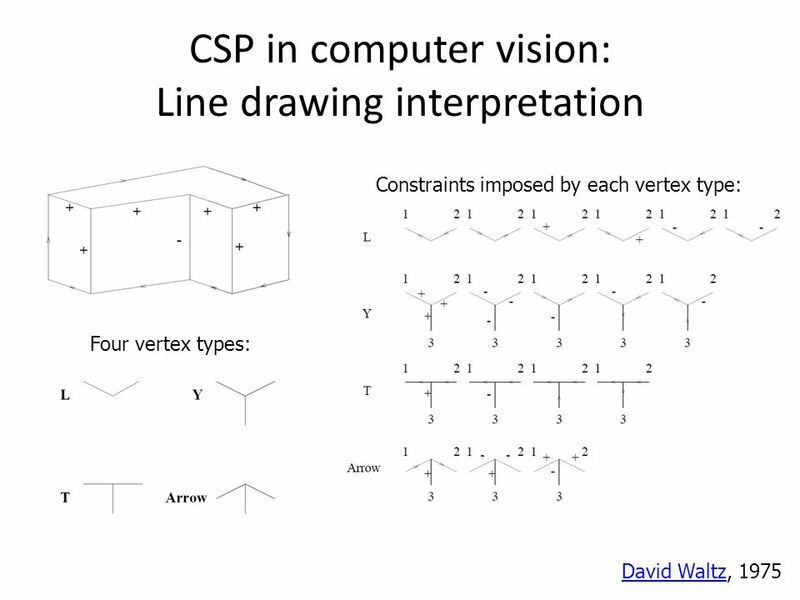 4 Feb 2004CS Constraint Satisfaction1 Constraint Satisfaction Problems Chapter 5 Section 1 – 3. 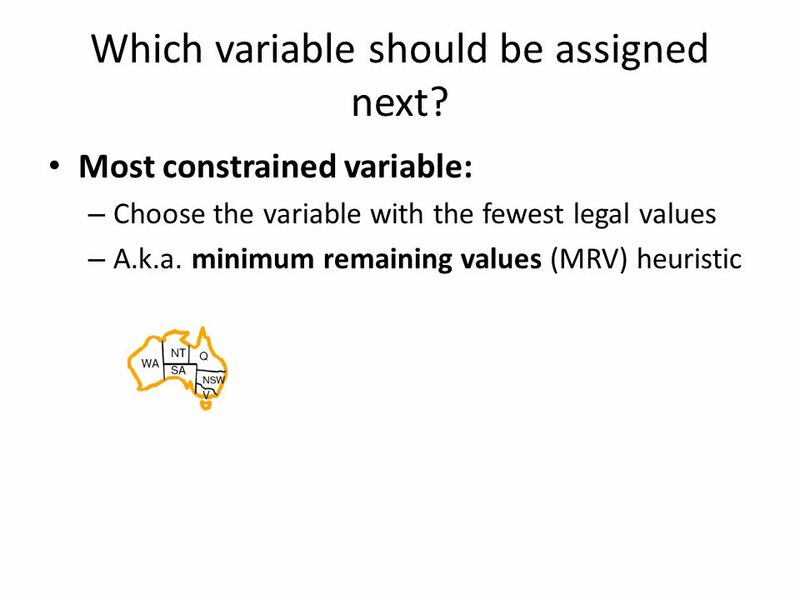 Artificial Intelligence Constraint satisfaction Chapter 5, AIMA. 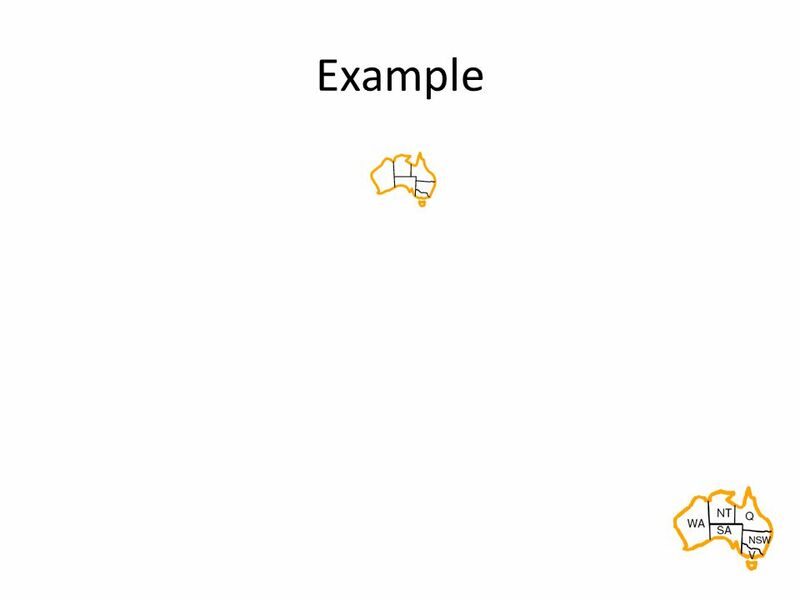 1 Constraint Satisfaction Problems Soup Total Cost < $30 Chicken Dish Vegetable RiceSeafood Pork Dish Appetizer Must be Hot&Sour No Peanuts No Peanuts.